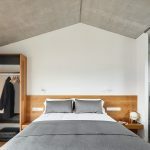 The Can Ramon house is located in the historic village of Aiguafreda, at the edge of the Montseny Natural Park, near Barcelona. Its construction dates from the beginning of the 18th century, when it was originally conceived to house a blacksmith’s forge on the ground floor and a residential area on the upper floors. 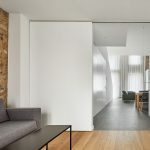 Over the years Can Ramon has undergone several modifications and extensions that have affected the interior space of the house, resulting in a less homogeneous appearance overall. 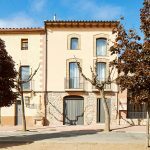 Due to its poor state of conservation, the decision has been taken to renovate the building and adapt it for use as tourist accommodation and a restaurant. 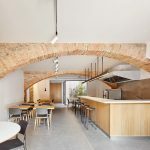 The objective of the renovation is to create a space that preserves the main facade and arches to retain the essence of its rural character and the identifiable elements of its location. 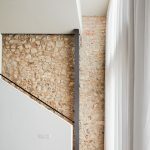 For the rest of the building a new geometry is envisaged, moulded by means of a metallic structure and reinforced concrete slabs that adapt it to its new use. Both procedures seek to generate a link between the past and the present. The architectural section drawing of the new visuals shows the narrow space of the rectangular plot. The four windows located on the two floors of the old building remain on the south facade, which faces onto the square. 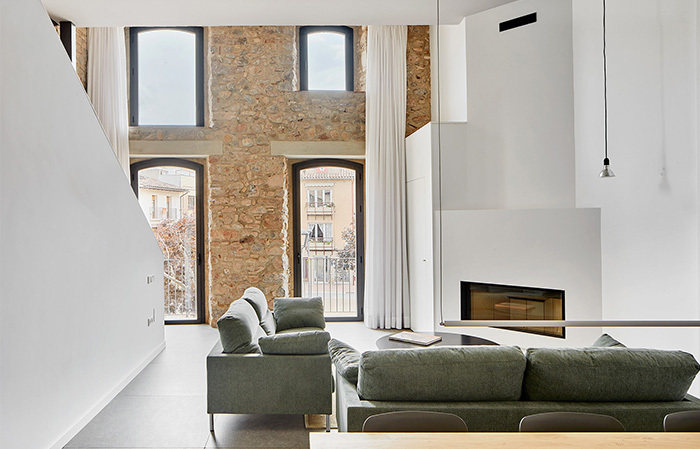 These windows, now located in a single space, provide a change of atmosphere depending on the incidence of light. 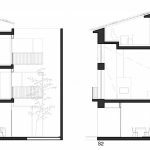 The project also proposes a patio at the north facade in order to provide light and ventilation, both on the ground floor and on the upper floors. 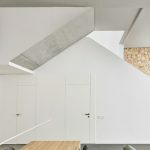 In the interior of the house the first floor benefits from a double-height ceiling, which transforms it into a space for interaction and living. This will become the hub generating the main activity of the house. 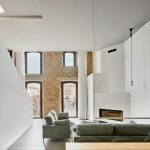 This central space, encompassing the living room, dining room and kitchen, affords a view of the exterior facade, but from inside the house. 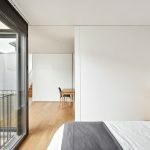 The curtains transform the space, removing the view of the facade and filtering the light. 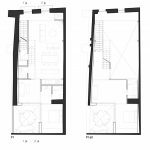 The two bedrooms are situated on the first and second floor, embracing the patio. 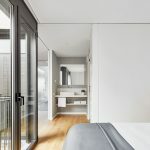 These diaphanous open spaces are adaptable to the needs of the guests. 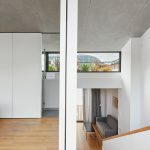 At a higher level, on the floor below the roof, is the third bedroom and the terrace. 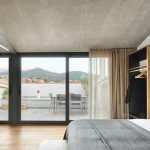 This exterior opening is protected by the same geometry as the house, achieving more privacy in relation to neighbouring buildings while offering an expansive view of the landscape that allows the inhabitants to connect with the surroundings of the Montseny massif. 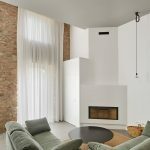 The new geometry and materiality defines the spaces in a way that takes into account scale as a key element of communication and harmonises all the uses of the house, enriching the way of living of its inhabitants. Finally, on the ground floor, iron doors that evoke the building’s blacksmith past provide the entrance to the restaurant, independent from the accommodation and accessible from the square. Both an open-plan dining area and kitchen are proposed in order to leave the arches visible. 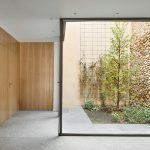 One of the most important features of this floor is the new patio, which allows natural light to enter during the day and serves as a lantern when darkness begins to fall. 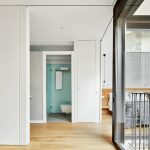 Ascending in the form of a vertical garden is a verdant connection between this exterior space and the upper floors. More：Albert Aregall 对gooood的分享。更多关于：Albert Aregall on gooood.